Truck Stops in Old Strathcona: The Kickoff! Occupation: I’m a Corporate Trainer in the area of Leadership & Employee Development. Basically this means on Mondays to Fridays from 8:30am to 5pm I support organizations in developing their culture, employee engagement, corporate communications, and leadership. The rest of my time is spent absorbed in all sorts of food related activities – eating, cooking, watching food related shows, going through food reads, and blogging. Bowl of frozen yogurt with fruit and mochi balls from Tutti Frutti. I will eat almost anything! However when I was traveling in Asia, I did have to put a caveat to that statement because I can’t bring myself to eating cats or dogs (or rats). But here in North America, very little I won’t eat… ok well maybe not black licorice. What is your personal specialty? I like to think it’s tagliatelle al ragu (what the folks from Bologna call Tagliatelle Bolognese). My secret flavour-inducing technique is tossing the rind of Parmigiano Reggiano into the simmering sauce. What is your weekday meal standby? Curry over quinoa – I love the MSG-free New Asian Home curry spice packs. We always keep packs on hand, especially the Thai red or green curries and Singapore yellow curry. It’s so easy to toss in some vegetables, chicken, prawns, and coconut milk. What is your favourite kitchen item? Probably my Cuisinart Elite 14-cup food processor. With 1000W of power, there’s not much it can’t do. But our Cuisinart hand held blender is a close second favourite. World ends tomorrow. Describe your last meal. My last meal would be a feast with friends and family. I would want the dishes to showcase the places I’ve lived and loved. In terms of dishes from my hometown of Vancouver – There would be sashimi because there always is at Cheng family gatherings (specifically salmon and toro) and xiaolongbao from Wangs (dumplings filled with pork and soup). I would also request some gelato from James at Bella Gelateria (Vancouver), possibly his salted caramel or Tahitian vanilla gelato. From Edmonton, I would want to have Daniel Costa’s truffled grilled cheese and pappardelle bolognese. From Calgary where I spent 8 yrs, I would ask for Charcut’s pig’s head mortadella and duck fat fried poutine. I would also want Aviv from Sidewalk Citizen to supply us with his apple dulce de leche brioche. I’d have the truffled oxtail tortellini from Anju. From home, my Dad’s prime rib and I would want my grandmother’s “cha goh” dumplings made from a rice flour dough, stuffed with ground pork, Chinese sausage, shitaki mushrooms, water chestnuts, and I’m sure I’m missing about 5 other ingredients. Funny enough, I would also want my childhood favourite – Tuna casserole made with cream of mushroom soup. Tutti Frutti frozen yogurt on Whyte Ave. Must get my frozen yogurt fix two-three times a week and I’ve yet to find another company with yogurt as good as Tutti Frutti’s. I’m craving it as I type this and I’ve had a bowl earlier. Where’s the best place to eat in Edmonton? I’m changing this question to “best placeS in Edmonton” because I can’t choose just one. Corso 32, Tres Carnales, Shanghai 456, and Zaika are probably my favourite food spots in Edmonton. Corso 32 because Daniel and Ben make my favourite pasta dishes in Edmonton and I’m in constant need of their amazing truffled grilled cheese topped with a sunny egg, Tres Carnales because the crew there is so hospitable it always feels like going to over to a good friend’s house. Their tacos are yummy and I never say no to sangria. Chef Wong at Shanghai 456 makes the best xiaolongbao (pork dumplings filled with soup) in Alberta. Not only is Zaika within a 5 minute drive from our house, their fish pakoras, onion naan, butter chicken, bhindi masala, and baingan bharta are absolutely delicious! We always have a great experience at Zaika. If you weren’t limited by geography, where and what would you eat? I’d go back to Macau and Italy. Macau is the Vegas of Asia. It’s located within a 1 hour long ferry ride from Hong Kong. From a culinary standpoint, Macau is a really interesting place. Although technically part of China, Macau was colonized by the Portuguese for 100 years. As a result, many Macanese dishes are a fusion of Chinese and Portuguese influences. I would go to Lord Stowe bakery to have some famous butttery and flaky Portuguese egg tarts – a fusion between the Chinese egg tart and the Portuguese pasteis de nata tarts. I would also go to “Tai Lei Loi Kei” cafe to have one of their famous pork chop buns, a marinated bone in pork chop inside a Portuguese bun. Not to mention a big bowl of braised pig’s feet and curried beef brisket over noodles. In Italy, I would go back to Tuscany for the five course beef dinner at Dario Cecchini’s famous butcher shop in Panzano. While there, I would have breakfast at Poggerino a quaint B&B in Radda Chianti where one of the owner Benedetta makes THE best omelette and quiche. We would also go back to Luccarelli for the to-die-for pappardelle al cinghiale (wild boar). And since geography isn’t a limitation I would hop over to Florence for the butter chicken at Trattoria Sostanza. Unlike Indian butter chicken, this one is roasted chicken breast baked in a lake of brown butter. Then hop over to Bologna for some tagliatelle al ragu and Pear and Cinnamon gelato from Sorbetteria Castiglione. 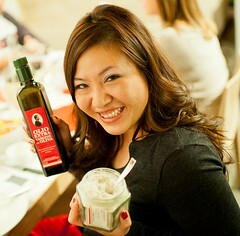 Carmen blogs at Food Karma.